I am still obsessed with animal prints, and all those stripy and spotty fall fashion outfits didn't help. They constantly reminded me of just how much I love Brugweg & Fils' Les Touches fabric. I know I sounded like a broken record - I said I wasn't going to fork out that much money for a pillow; but I also know that Les Touches Black and White would look amazing in any room of my house, so I couldn't let it go. I exchanged emails with Hollie of Stuck on Hue on Etsy on and off a few times over the past couple of months, mostly because I couldn't decide whether to bite the bullet. Hollie was extremely helpful and patient, and worked with me to pick out a section of the fabric that would show a symmetrical yet organic pattern. I finally decided to go through with it, and I ended up ordering not just one, but two of them! I have to say this is by far my favourite pillow/fabric in my house right now - the Brugweg & Fils' Les Touches in Black and White. The other one is now on my foyer sette. Hollie has tons of other gorgeous pillows in her Etsy store, all handmade by herself with superb sewing workmanship. Her choice of fabrics is on trend yet timeless. I am already eyeing this Kelly Wearstler's Channels in Ebony & Ivory. It would also look great as a long body or lumbar pillow like this. 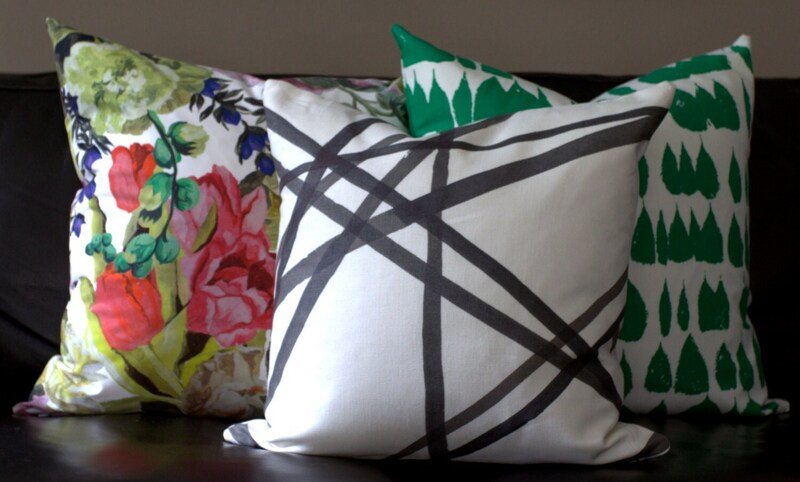 Hollie's pillows are widely used in interior designers' homes and projects. Like this 20-inch leopard velvet pillow in designer Sherry Hart's dining room. And the banana leaves pillow covers paired with a black and white striped headboard by Sara Lorton Designs. And there are so many more in her Etsy store. Hollie is also the talented DIY blogger behind I'm Busy Procrastinating. Check out this amazing DIY Black & White abstract art she painted for her living room. 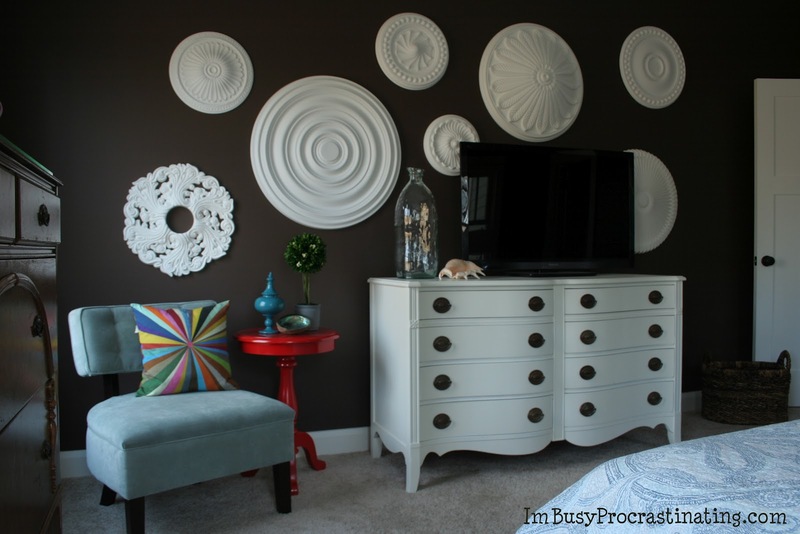 And the ceiling medallions as statement wall art, how creative! Hollie is on vacation until early October so her Etsy store is temporarily closed. Be sure to check back for all the fabulous designer pillow covers she offers at likely the best prices you can find anywhere online.